Created by Ramesh Reddy on Jan 13, 2014 11:44 AM. Last modified by jason.marley on Jan 17, 2014 7:24 AM. For the purpose of this example, I am using sample data from http://data.gov about baby names collected from social security numbers. The data is arranged by state. You can download data from http://catalog.data.gov/dataset/baby-names-from-social-security-card-applications-data-by-state-and-district-of- A copy of the file is attached. This ZIP file contains may different files, one file for each state with names of the babies with following format. Unzip the "namesbystate.zip" file into any directory. For the purposes of this article I will assume this is unzipped into "/babynames" directory on your local machine. Now rename "/solr/example/solr/collection1" to "/solr/example/solr/babynames"
Edit "/solr/example/solr/babynames/conf/schema.xml" and delete all elements under "<fields>" and "<copyFields>"
Now the below contents under "<fields>" contents. Save and close above "schema.xml" file. These fields represent the schema for the data that is present in baby names CSV document from above. The schemal.xml file defined the internal document structure of Solr. 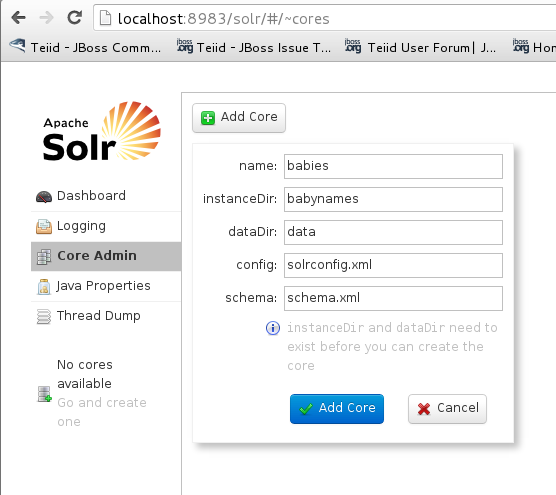 Once the Solr is started, using a web browser go to address "http://localhost:8983/solr"
Now click "Add Core", and "babies" as core name and "babynames" as directory name as shown below. Now the Solr set up is complete. Make sure there were no errors while doing this. The above tasks, configured Solr with a "core", that can store/search documents. Start Teiid Designer, switch to "Teiid Designer" perspective. Configure the Teiid Server, make sure you have made connection to Teiid Server. Create a new "Teiid Model Project" and name it "BabyNames". We need to create two separate source models, one for the CSV files, and another for the "Solr". A pre-built sample project attached "designer_project.tar"
Choose "File -> import", then choose "Teiid Designer/File Source Flat >> Source and View Model". Follow directions in the article Connect to a Flat File using Teiid to create model based on files. Once you are done a view table like below. 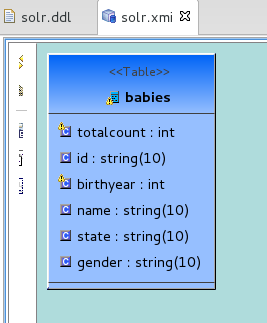 You can preview the data on right clicking on "babies" table, "Modeling -> Preview Data". Make sure this is successful. 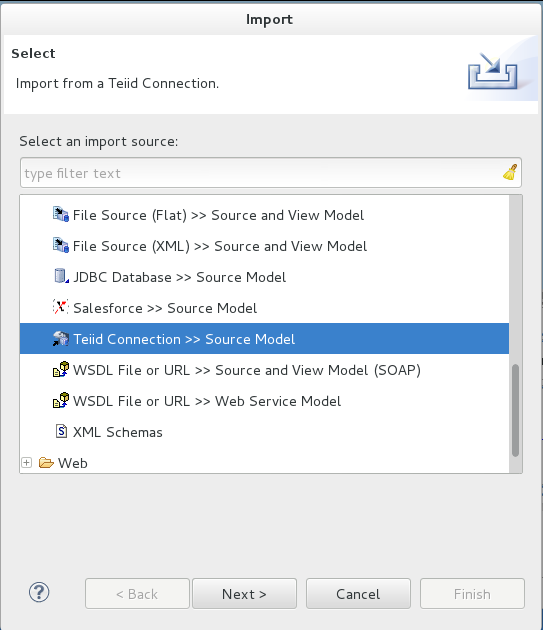 Choose "File -> import", then choose "Teiid Designer/Teiid Connection >> Source Model". In this dialog box make sure your "translator" is set to "solr", and click "Next >"
When done you will see below table. Do a manual fix for [TEIIDDES-2018] by editing the data type property. Now build a VDB called "babynames" with all the models in this VDB. Deploy to server. You can right click deploy. Make sure you created data sources correctly. 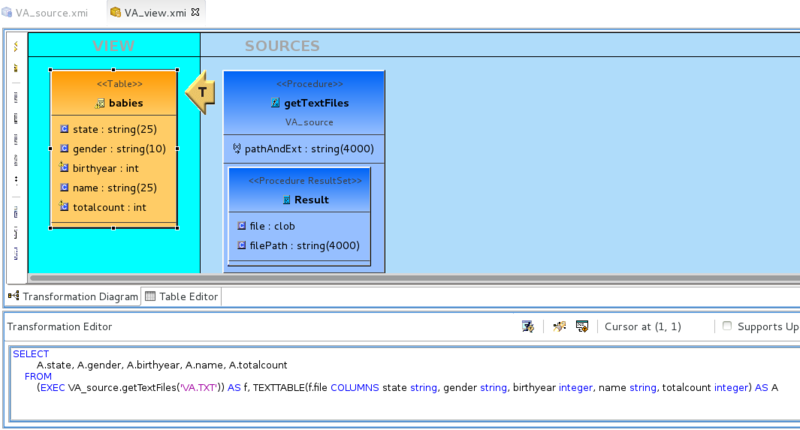 Edit "standalone-teiid.xml", under "resource-adapter" section add the XML for creation of data sources. 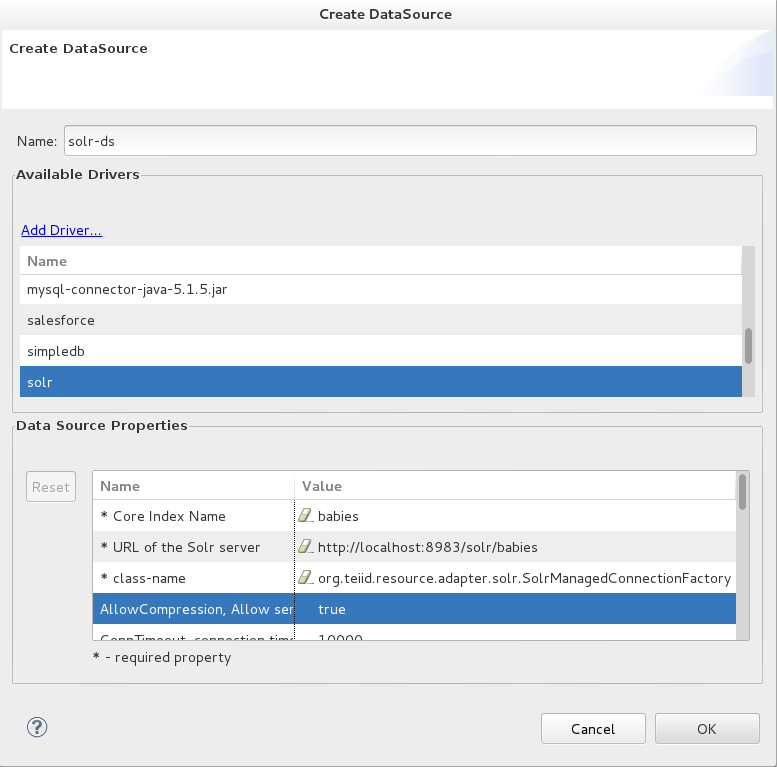 Create the following dynamic VDB, name the file as "babynames-vdb.xml"
Now using a tools like SquirreL or Eclipse Data Tools, you can issue queries like below. Elapsed Time:  0 hr, 1 min, 31 sec, 424 ms.
Hopefully this article gave how to integrate Solr data with Teiid. Let us know if you have any comments or suggestions in Teiid forums.